Pinto beans are the mature seeds of a type of legume. 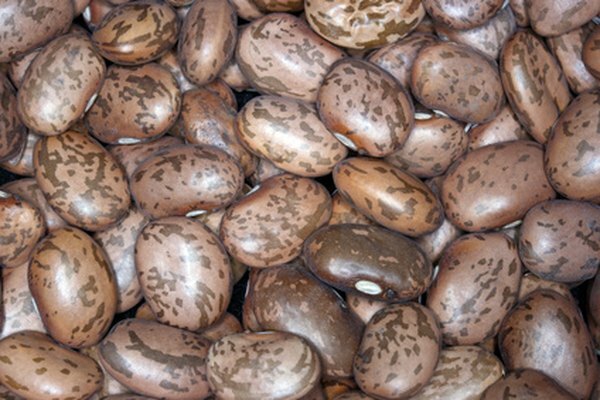 Usually preserved by drying or canning, pinto beans resemble kidney beans in size and shape but are tan with streaks of reddish brown, which disappear as the beans cook. A nutritious food, pinto beans are high in protein and carbohydrates and low in fat. They also provide a significant amount of certain vitamins and minerals and are high in dietary fiber. The USDA Nutrient Database indicates that a typical serving of 1 cup of boiled pinto beans weighs 171 grams. Carbohydrates make up around 45 grams of that weight. There is 1 gram of fat in a cup of pinto beans, as well as about 15 grams of protein, which is 33 percent of the 46 grams of protein women need each day. A 1-cup serving of pinto beans provides around 245 calories, or approximately 12 percent of the daily recommended caloric intake if you follow a 2,000-calorie diet. Carbohydrates provide 182 calories of that, proteins deliver approximately 53 calories, and fat comes in at around 10 calories. Pinto beans contain substantial amounts of certain essential vitamins. The highest of these is folate at almost 300 micrograms or 75 percent of the 400 micrograms women need each day. Other high concentrations of vitamins include thiamine at 0.3 milligrams or 25 percent of your daily needs, and vitamin B-6 at 0.4 milligrams or around 30 percent of your daily requirement. Lesser amounts of other vitamins within the serving are vitamin C, vitamin E, vitamin K, riboflavin, niacin and pantothenic acid. A single serving of pinto beans is also an excellent source of many essential dietary minerals. Manganese at 0.8 milligrams or 40 percent of your daily needs, has the highest level. Other significant quantities of minerals within the serving include iron at 3.6 milligrams or 20 percent of the 18 milligrams women need each day. There are also 250 milligrams of phosphorus, which is 35 percent of the 700 milligrams women need each day. The same cup of pinto beans contains 86 milligrams of magnesium. That's 23 percent of your daily needs. With 746 milligrams, pinto beans also supply 16 percent of the potassium women need on a daily basis. That same serving also has a good amount of calcium, zinc, copper and selenium. Pinto beans are naturally low in sodium, providing just 1.7 milligram, or less than 1 percent of the total amount recommended each day within each serving. The same amount delivers a substantial quantity of dietary fiber at 15 grams, which is 60 percent of the 25 grams you should include in your daily diet. Pinto beans contain no appreciable amounts of saturated fats, trans fats or cholesterol.